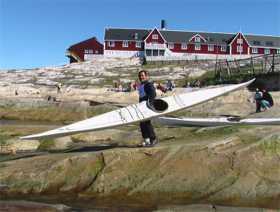 Traditionally, Greenland kayaks consisted of a driftwood frame with a covering of seal skin. The technique is known as skin-on-frame, SOF or skinboat construction. If we take the seal out of the equation it's a fast, pleasant, economical and environmentally friendly way to build a good kayak. This old kayak, photographed in Greenland by Richard Best, is covered in sealskin. Today the skin is usually made of woven fabric. SOF kayaks are usually light but they are surprisingly tough.They can survive being dropped 10 feet onto concrete but they do not like being dragged over rough surfaces or sharp objects. They may be damaged if jumped on or in big surf but then so may any sea kayak. If possible they should be stored in a cool, dark, dry place when not in use. Another of Richard's photos showing that SOF construction is still very popular in Greenland. It is attracting more and more interest in the USA, Europe and Scandinavia where first-time builders often already have a plastic or composite kayak but want to try something a little different. Unlike most other construction methods, you do not need to make a mold before starting work on the kayak itself, just a couple of wooden trestles to keep the work at a convenient height. The first step is to make the skeleton or frame from quite thin pieces of wood. Over the frame, you stretch a skin of heavy-duty woven fabric which you then paint with a liquid sealant to make it waterproof. Rather than being glued and screwed together, the wooden parts of the frame are usually lashed together with a synthetic substitute for the traditional animal sinew. 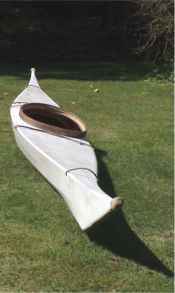 A skin-on-frame kayak consists of a wooden ladder, where the ladder sides are the gunwales and the rungs are the deck beams, with a heavy-duty basket of flexible ribs and stringers underneath it. The ribs go from one side of the kayak to the other. They're bent into a C-shape and they act as springs. The stringers and keel go almost the full length of the kayak, outside of the ribs. They streamline the hull shape, and stop the skin from touching the ribs so water flows smoothly along the length of the hull. 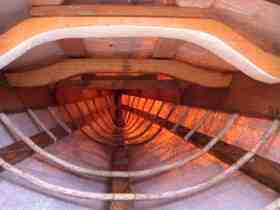 The stringers and the keel are thicker than the ribs, but the twenty-odd ribs hold them in the right place so it's essential to give the ribs the correct curve. Ribs can be made of thin wooden rod as in the photo below, but more often they are thin planks. To make them flexible they are soaked in water, steamed until they are floppy and then swiftly bent into shape. There's typically a gap of 6 inches between each rib and the next. The strongest single part of the kayak is the masik, a curved deck beam which supports the front of the cockpit and acts as a knee brace. This photo is taken from the cockpit looking forwards, and the masik can be seen at the top. Structurally, the frame is halfway between a rigid skeleton and a flexible open-weave basket. When it is complete, builders don't want to lose flexibility by sealing the frame with epoxy resin like most wooden boats. That would make the lashings stiff and rigid. Instead, they often seal the wood with a traditional matt finish such as teak oil or Danish oil. See Protecting Your Wood Kayak. When the frame is complete, turn it upside-down and lay the skin fabric over it so that it hangs down on each side. Stretch the cloth from end to end, tack it temporarily into place along the keel, turn the kayak the right way up and sew the edges together along the deck so that the skin is tightly stretched over the entire kayak. A first-time builder is not likely to achieve a very straight seam but this is often considered to be a good thing. The aesthetics of plastic kayaks don't apply to skin boats. Most SOF builders like to make a cockpit coaming of traditional appearance, as in this photo by Bill Sansom. One way is to take a strip of ash or sweet chestnut slightly longer than the circumference of your cockpit, 1.5 inches wide and 0.25 inches thick. Steam the strip to make it flexible, wrap it round a cylinder the size of the desired cockpit and rivet the ends together. If the design calls for it, you can attach it to the deck beams with wooden pins. If not, you can just sew the skin onto it. It's not traditional to do so but you can consider adding a lip of rope or wood to make sure your sprayskirt stays on in rough water and when rolling. The skin can be sealed by painting on anything from house paint to industrial sealant. See Skin-On-Frame Materials, below. In Greenland, SOF kayaks are generally white but you can use a translucent sealant. This is a lovely sight with the sun shining through it like amber. For a traditional appearance, many builders fit deck-lines of leather polyester rope with a traditional appearance. Various manufacturers make polyester ropes in diameters from 5/32" (4 mm) upwards which look like three-strand manila hemp. For example Liros Classic or Wellington's Unmanila. It is also very attractive to fit end-tips, beads and sliders made of simulated ivory. You can use bone, deer antler or a plastic such as Corian. SOF construction requires some woodworking skill but you can acquire that while building. It is easy to get comprehensive information about the technique, and we list some sources below. Rather than cover their kayak with cloth and apply a separate sealant, some prefer to put on a skin of pre-coated waterproof industrial fabric of the kind used to make truck tarpaulins. Generally this is a polyester fabric coated both sides with PVC so it can easily be solvent-welded. In other words, cleaned with acetone / methyl ethyl ketone (MEK) and then glued with vinyl cement. It can be difficult to make a skin that does not have wrinkles and bulges, but see Tom Yost's inspirational site at www.yostwerks.com or www.yostwerks.org. UV-stabilized industrial PVC tarpaulin of 550 to 600 g/m2 (16-18 oz per square yard) is tough and almost unaffected by sunlight. A few suppliers can provide tarpaulin as thick as 900 g/m2 (26 oz per square yard), which is as tough as old boots and ideal for for the underwater parts of a kayak. For vinyl cement, note that the thickened PVC cement sold for plumbing is fine for PVC pipes but not for PVC sheet. For adhesive and valves which you can use with tarpaulin to make make inflatable sponsons and buoyancy bags, try an inflatable boat parts supplier. See Additional Flotation For Your Kayak and Skin-On-Frame Kayaks & Offshore Safety, below. Deciding what materials to buy, and finding suppliers who will sell small quantities, can take ten times as long as building the kayak. Most SOF kayak builders prefer to skin their kayak with a very thick nylon or polyester fabric, and waterproof it themselves by brushing on a high-tech hell-brew of a sealant. Some prefer to skin their kayaks with a natural cloth such as cotton canvas as in the illustration, or the stronger flax canvas, cut and stitched to fit tightly over the frame and then waterproofed with natural materials. In case you were wondering, we are told that Irish currach builders usually use 12-18 oz / square yard cotton canvas proofed not with bitumen, which they find has poor UV resistance, but either Tuskar Tar if they can get it, or a mix of hot coal tar and natural pitch. See Currach. A heavyweight polyamide (nylon) textile is arguably the strongest SOF skin material. Often called ballistic nylon, it was once used in multiple layers to make bullet-proof vests. Most sea kayak builders use nylon textiles with a weight from 8 to 10 ounces per square yard, although some prefer 13 or 16 oz/ sq yd. A slight problem with nylon textiles is that they get baggy when wet. The taut skin of your kayak may temporarily loosen every time you use it, giving a slightly wrinkly appearance. Polyester fabric such as Dacron is cosmetically better for SOF boats because it can easily be heat-shrunk to make a very smooth skin which will stay taut, wet or dry. Heavy-duty polyester fabric is available in the same weights as nylon but has only about 70% the strength of a nylon fabric of the same weight and weave. Polyester is the preferred material for sails and tents because it stretches less than nylon. It If you intend to coat your kayak with a low-stretch polyurethane sealant, it will probably stick better to polyester. Both nylon and polyester will be damaged by ultraviolet if exposed to much sunlight. Which is more vulnerable to UV damage? This is an important issue for sailmakers, paraglider pilots, rock climbers, etc. Polyester fabrics intended for sails, kites, ropes and tents are coated by the manufacturer with a particularly effective UV shield, and are less vulnerable than nylon. However polyester fiber without a UV shield is much more vulnerable than nylon and must be protected from sunlight. Some SOF boatbuilders coat it with one or more layers of opaque aluminum paint. Certainly if you cover it with a clear sealant to get that popular translucent effect, the sealant must contain a UV filter. Heavy textiles of this sort are used to make sports holdalls, sacks for industry and industrial dust extraction filter mesh. The manufacturers will not sell small quantities to kayak builders. Probably the main retail supplier of skin fabrics worldwide is George Dyson. There's also Corey Freedman's Spirit Line shop and Kavon Filter in New Jersey. See Retail Outlets. Whether you skin your kayak with natural or synthetic cloth, when you have it tight and smooth you must waterproof it. This is usually done by applying a quick-drying sealant, brushing it on if the sealant is liquid. Could this be the profile of the ideal coating for skin-on-frame boats? Sticks to nylon by a chemical bond (most coatings won't stick to nylon without a chemical etch but they will form a mechanical bond by squirting between the nylon fibers and wrapping round them as they cure); has high tensile / peel strength; can be pigmented or can reliably be applied to cloth which has been dyed; is non-toxic, non-allergenic, non-carcinogenic and non-teratogenic during and after application; isn't sensitive about temperature and humidity in your workshop; is pleasant and easy to apply; fills the weave in your cloth to make a smooth professional surface; won't explode if there's a spark in the workshop; won't burst into flames if you leave some overnight on a rag; is eco-friendly with low or no VOCs; doesn't shrink as it cures, or no more than 2%; will stretch by 300% or more when you hit a rock; doesn't lose flexibility with age; is capable of resisting UV, salt and the usual harbour chemicals; doesn't absorb water when cured so it doesn't blister if it stays wet for a long time; is capable of protecting the skin fabric from UV; is highly resistant to abrasion; doesn't reduce the strength of the cloth, or not by more than 25%; can be recoated when scuffed; doesn't support mould growth; doesn't smell of plasticizers for years after you apply it; doesn't leave black or white marks on your clothes or other boats. Oh yes, and it's affordable and lasts at least ten years. The toughest sealant would be layers of liquid neoprene (chloroprene) brushed onto the outside of the hull, with layers of hypalon (a DuPont trademark for chlorosulfonated polyethylene) on top of that. These sealants are available from Gaco Western. They're supplied in solution with a lot of hazardous and unpleasant VOC solvent, add significant weight to the boat and are usually opaque. Alternative sealants which are increasingly popular with SOF builders are translucent two-part polyurethanes (urethanes). Although expensive and hard to find, they are light and very tough. They're as thick as honey so they're smoothed on with a plastic squeegee. The handful of SOF teachers who also retail materials keep the exact identity of their sealant a closely-guarded secret. Rumor has it that it is normally sold for sealing cement floors. Technically it would be a two-part flexible high-build solvent-free (100% solids) cold-applied penetrative urethane sealer. We think we're right to say that Corey Freedman can and will mail his product to anywhere in the world, and it's pretty hard to beat. Contact The Skin Boat School a.k.a. Spirit Line. www.skinboats.org. There's also Coelan Boat-Coating. This is clear but you can add pigment. It contains a UV filter. It makes a very, very durable varnish for exposed wood, and a flexible primer is available so you can use it on flexible surfaces such as inflatable boats. It's not cheap, but it's a real possibility for sealing your skin-on-frame boat. Mike Bielski is very positive about it in the Qajaq USA newsletter Masik for Spring/Summer 2009. Check with the manufacturer if you're thinking about using it below the waterline on a bigger boat which may be continuously afloat for a week or more. For a possible downside relating to ultimate strength, see the article by Friedrich Vetterlein cited below. Another possibility, though much less strong and less abrasion-resistant, is two-part polyurethane yacht varnish; or one-part yacht varnish which has the virtue of being readily available and inexpensive. Yacht varnish makes a reasonably effective and durable sealant on bare fabric, perhaps with a layer of outdoor enamel paint on top. Like a coating of boatbuilders' epoxy resin, these finishes have very low elongation so they are likely to crack along the chines and other lines of stress. None of these sealants is exactly eco-friendly. Some contain high levels of VOCs and most are toxic. You could consider sealing your kayak with a couple of layers of ordinary latex house paint. This is quite effective as a sealant, but less durable than the hell-brews and has very low abrasion-resistance. So no seal launches or dragging your kayak over the pebbles. For those who prefer truly natural materials, there are various possible sealants including linseed oil and beeswax. The strength and durability of the final combination of fabrics and sealants varies wildly. Guillemot Kayaks' Kayak Forum hosts a very interesting article online by a German researcher, Friedrich Vetterlein, who in 1998 was interested primarily in the challenge of building a baidarka with a flexible frame. For the skin, he experimented with many different coatings on a range of textiles including a 450 gm/ square meter cotton canvas, a 315 g/m2 linen or flax canvas which had a tear strength nearly twice as high as the heavier cotton material, and a 510 g/m2 nylon fabric from Dyson, Baidarka & Co which had a tear strength five times stronger than the flax canvas. He found that the thinner coatings which soaked right into the fabric often halved its resistance to tearing. He did not test any two-part solvent-free polyurethanes. He found that the performance of fabrics sealed with neoprene and hypalon was way ahead of the others. For his own baidarka, he eventually went with a brush-on neoprene called GXGQ 8802, from Conti-Tech, Breslauerstr.14, D-37154 Northeim, Germany. The article is at www.guillemot-kayaks.com/Building/FlexibleBaidarka/index.htm. Thank you to Friedrich, and to Guillemot and Nick Schade for hosting it. • Building the Greenland Kayak by Christopher Cunningham (McGraw-Hill, 2003). He's the editor of Sea Kayaker magazine. The book mainly describes how to build one style of Greenland kayak, but you can use the advice with plans from the internet to build almost any size or shape of kayak you like. • Traditional Kayaks, a more purist site by Harvey Golden at www.traditionalkayaks.com. • Instruction in Kayak Building, H C Petersen, Greenland Provincial Museum & Viking Ship Museum, 1982. To buy, see Books & Magazines. • Building Skin-On-Frame Boats, Robert Morris, Hartley & Marks, 2001. • Umiak, An Illustrated Guide, Skip Snaith, Walrose & Hyde, 1997. Click here for links to organizations which run SOF building courses in North America and in Europe. "[The kayakers of Angmagssalik] say there is no danger of the kayak being damaged unless the waves actually break against the chest of the man... when they see an exceptionally dangerous wave coming they capsize on purpose, take the wave on the bottom of the kayak instead of letting it hit them in the chest, and then when the wave is safely past they come up again with the paddle". SOF kayakers have the same safety concerns as hardshell kayakers but different solutions. SOF kayaks differ from hardshell boats in that they often have extremely low volume, and they are seldom fitted with bulkheads, positive flotation, decklines, end loops or pumps. We will look at each below. A sea kayak with very low volume for its length can look very good, if you like lean and mean. It will probably be light, fast, very easy to roll and not so badly affected by wind, which is the kayaker's big enemy. However it will have next to no stowage space, will sink with only a small amount of water inside, won't be quite as strong as a deeper boat, and will often misbehave in surf. See High Or Low Volume. Let's say the kayak is at least big enough for you to get in and out without getting stuck, but when you sit on the back of the cockpit coaming while getting in, the rear deck is only a fraction of an inch above the water. Obviously you will find it hard to get in and out alongside a dock or in shallow water without getting a wet backside. Now imagine a deep-water rescue. The final stage is to get the casualty back into his or her kayak, and get the sprayskirt back on. If the casualty has a very low volume kayak, then when (s)he sits on its rear deck the kayak may start to flood again as waves fill the cockpit. One solution is to place the casualty's kayak across the top of the rescuer's kayak so that they make an X. 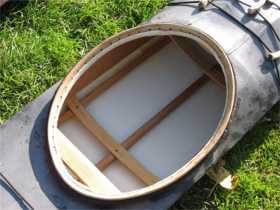 To avoid damaging the rescuer's sprayskirt, usually this is done so that the cockpit of the casualty's kayak is just behind the rescuer's cockpit. The casualty's boat is then high enough out of the water to get the sprayskirt back on before (s)he slides the kayak back into the water. The cockpit of a SOF kayak can be fitted with a sea sock of waterproof fabric, which is great for keeping mud, sand and sharp bits of shell out of your boat so they don't damage the skin. It is also good for limiting the amount of water that enters your kayak through the cockpit if your sprayskirt comes off. See Sea Sock. Pavia Lumholt has installed fabric bulkheads in a SOF kayak. Click here for an illustrated article. Transparent air bags don't ruin a SOF kayak's looks much, or permanently. You can buy buoyancy bags or make them yourself. If you make them yourself, you can make them oversized so that when inflated they tend to fill the big gaps between ribs which could otherwise hold a large amount of water. See Additional Flotation For Your Kayak. SOF kayaks seldom have a continuous line installed round the perimeter of the deck as on most modern kayaks. Instead, at several points on both the front and rear decks, pairs of ropes are attached from one side of the deck to the other. See photo. Deck rigging needs to be placed with a view to effective deep-water rescue. A rescuer holding one end of an empty, flooded, slippery kayak needs to be able to reach along it and find a handle which (s)he can use to start easing it onto his / her deck. (S)he is not going to want to reach much more than 3 feet at one time, so the rear deck needs two sets of paired lines. As to the front deck, if a spare Greenland paddle is firmly attached there it will make an excellent grab handle during a deep-water rescue. Inuit kayaks generally had a knob of bone at each end as in the photos at the start of this section. Is there no evidence that they ever had end loops? They're easy to fit to a SOF kayak and would make it easier to haul a kayak out onto an ice floe or hang it up out of the way of hungry sled dogs. They are very useful if a kayak is to be towed. And however good you are, you may need to be towed. For example if you are carrying out a deep-water rescue when you and the casualty start to drift into danger. True, the person doing the towing can rig a temporary end loop by tying knots in a tow-line, but this takes time and may require them to put down their paddle while not properly rafted to another kayak. A lot of hardshell kayaks have no permanent pump because their owners prefer a lightweight portable one. These work just as well with SOF kayaks. See Built-In Pump vs. Portable Pump.